I hope that you will get some use out of what the site has to offer. It is not here just so I can bask in the questionable glory of having "self-blogged." I am busy, learning DotNetNuke, ASP.NET and Flash, volunteering for my union local as the Safety Committee Chairman, playing as often as possible with my two fantastic grandkids, earning a living from my employer, trying to have a life, etc... just like you! February 23, 2009. The site has migrated to a much more robust web technology and it has been fun learning what it took to use it. Most links have been updated. There are still some sections that are "under construction" but that's the nature of maintainaing a web site when so many things around us are always changing. The CG AV8R Forum has been taken down, at least for now. There is a really crisp forum module available, but it had so little activity that I need to rethink whether to use it at all. Input welcome on this. April 27, 2004. The corrupted nav bar is fixed. Everything is back to normal..
October 8 , 2002. Response to the CG AV8R Forum has been somewhat slow, but I am sure the word will get passed. Do what you can to let all Coast Guard Aviators, former and current, know about it. Some have work in or out, and others are looking. Virtually all can benefit by participating. It's here, it's for you. Click the icon for a printer-friendly, version of my resume. Yes, there is life after 21 years with friends, doing almost all the things you are not supposed to do in and/or with an airplane, all for the noble cause "that others may live." In fact, I have gone places, seen things, and had adventures I would never have dreamed of in 1990. 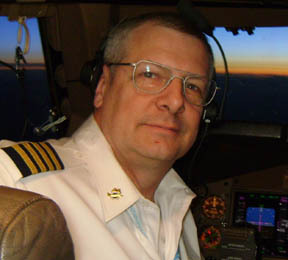 I fly as a line check captain on the Boeing 747-400 and the new -8, and have been a simulator instructor and ground school instructor particuarly for aircraft performance and navigation, since November 1999. Even if you aren't looking for someone, make sure you register yourself...someone may be looking for you.